SUMMARY. Objective. The aim of this work was to identify risk predictors of a negative psychological outcome among personal, situational and systemic characteristics of women who choose to interrupt a pregnancy by elective (e.g., not feeling ready for giving birth) or therapeutic means (e.g., fetal abnormalities). Methods. A prospective study on two cohorts were conducted and focused on a group of women: the first recurred to elective abortion (VTP) (n=20) and the second recurred to therapeutic abortion (TTP) (n=30). The psychological distress was measured before and after abortion through the administration of two psychometric tests: SCL-90-r and CES-D. Dependent samples t-test was used to evaluate the tendency of the two cohorts’ mean scores before and after abortion; repeated measures analysis of variance (ANOVA) was used to analyze the variance of mean scores of subgroups isolated for variables of interest before and after abortion. Results. After the termination of pregnancy, in VTP a significant decrease between t-0 and t-1 mean score (p<0.05) was observed in all SCL-90-r’s global scores and subscales: GSI (p=0.036), PST (p=.031), PSDI (p=0.004), SOM (p=0.009), DEP (p=0.032), ANX (p=0.036) and even in CES-D score of DEP (p=0.017) and SOM (p=0.011) subscales. In TTP a relevant decrease was found in SCL-90’s SOM (p=0.023) and ANX, (p=0.016) subscales and in CES-D total score (p=0.020), POS (p=0.014) and SOM (p=0.09)subscales. In VTP group presence of partner support and absence of relational problems resulted as protective factors from a worse outcome. Conclusion. The results of this study suggest that, following an induced abortion, women experienced a significant improvement in the mood state compared to the period before the event; poor partner support and relational problems related with the abortion emerged as risk factors for a significantly worse psychological outcome compared to other causes interruption of pregnancy. KEY WORDS: elective abortion, therapeutic abortion, psychological implications, termination of pregnancy. RIASSUNTO. Obiettivo. Lo scopo di questo lavoro è stato quello di identificare i fattori predittivi del rischio di un esito psicologico negativo tra le caratteristiche personali, situazionali e sistemiche delle donne che decidono di interrompere volontariamente una gravidanza (per es., non sentirsi pronte per il parto) o per motivazioni terapeutiche (per es., anomalie fetali). Metodi. Uno studio prospettico su due coorti è stato condotto e focalizzato su un gruppo di donne: il primo ha ricorso a un aborto volontario (VTP) (n=20) e il secondo ha ricorso a un aborto terapeutico (TTP) (n=30). Il disagio psicologico è stato misurato prima e dopo l’aborto attraverso la somministrazione di due test psicometrici: SCL-90-r e CES-D. Il t-test dei campioni dipendenti è stato utilizzato per valutare la tendenza dei punteggi delle due coorti prima e dopo l’aborto; l’analisi delle misure ripetute della varianza (ANOVA) è stata utilizzata per analizzare la varianza dei punteggi medi dei sottogruppi isolati per le variabili di interesse prima e dopo l’aborto. Risultati. Nel periodo successivo l’aborto, in VTP è stata osservata una diminuzione significativa tra il punteggio medio t-0 e t-1 (p<0,05) in tutti gli indici globali e in specifiche sottoscale di SCL-90-r: GSI (p=0,036), PST (p=,031), PSDI (p=0,004), SOM (p=0,009), DEP (p=0,032), ANX (p=0,036) e nei punteggi al CES-D delle sottoscale DEP (p=0,017) e SOM (p=0,011). In TTP è stata riscontrata una diminuzione rilevante nelle sottoscale di SCL-90 SOM (p=0,023) e ANX, (p=0,016) e nel punteggio totale CES-D (p=0,020) e nelle sottoscale POS (p=0,014) e SOM (p=0,09). Nel gruppo VTP la presenza del supporto dei partner e l’assenza di problemi relazionali sono risultati come fattori protettivi per esiti psicologici negativi. Conclusione. I risultati di questo studio suggeriscono che, a seguito di un aborto, le donne hanno avuto un miglioramento significativo dello stato dell’umore rispetto al periodo precedente l’evento; lo scarso supporto del partner e i problemi relazionali correlati all’aborto sono emersi come fattori di rischio per un esito psicologico significativamente peggiore rispetto ad altre cause di interruzione della gravidanza. PAROLE CHIAVE: aborto elettivo, aborto terapeutico, implicazioni psicologiche, interruzione di gravidanza. Abortion has been a legal medical procedure in Italy since the enactment of Law May 22nd 1978, n. 194, “Standards for social protection of maternity and elective interruption of pregnancy”1. Law 194 disciplines the recurring to elective (within the first 90 days after conception) and therapeutic abortion (between 90 and 180 days after conception). Abortion can be performed after the first 90 days of pregnancy only if: a) the pregnancy or the birth are at a very high level of danger for the woman’s health or b) there are established disease processes – including those related to relevant anomalies or malformations of the fetus – which constitute a grave danger to the physical or mental health of the woman. Before the enactment of Law 194, abortions were illegal performed by non-authorized physicians, often in precarious conditions and with an increased risk of permanent injuries or death of the woman: it was estimated that before the introduction of Law 194 from about 11,000 2 to 20,0003 women died annually in Italy because of complications related to illegal-performed abortions, while in 2014 only two deaths – which cause is still under investigation –resulted from legal abortions4. Since the introduction of Law 194, abortions in Italy dropped from the 234,801 cases of 1982 – the year with the highest number of abortions – to the 102,760 cases of 2013, making Italy one of the countries with the lowest abortion rate in Europe4. For what concerns the relationship between abortion and mental health, although it is acknowledged that some women may experience sadness, grief, and feelings of loss following termination of a pregnancy, literature found no sufficient evidence to support the claim that an observed association between abortion history and mental health was caused by the abortion per se, as opposed to other factors5-10. Literature identified several factors that are predictive of more negative psychological responses following first-trimester induced abortion among women. Those factors included perceptions of stigma, low social support for the abortion decision, a prior history of mental health problems, personality factors such as low self-esteem, use of avoidance and denial coping strategies, and characteristics of the particular pregnancy, including the extent to which the woman wanted and felt committed to it 5,8; of these, prior mental health status emerged as the strongest predictor of post-abortion mental health5,6,11,12. In the assessment of psychological implications of abortion is important to consider that women obtain abortions for different reasons, at different times of gestation, via differing medical procedures and within different personal, social, economic and cultural contexts, and that all of these factors may lead to variability in women’s psychological reactions following abortion5. There’s agreement that the most appropriate study design for research on psychological implications of abortion is a prospective longitudinal study of a large cohort of women drawn from the general population5,6. 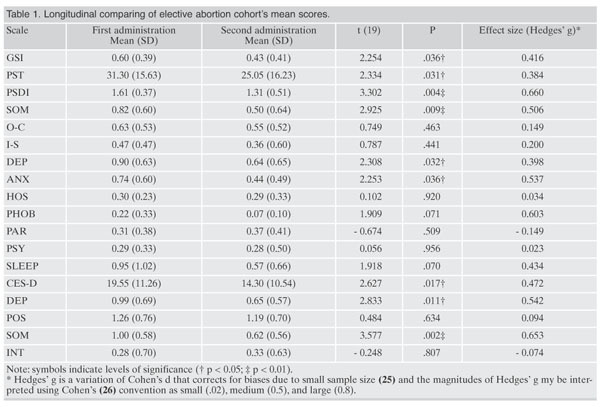 The research on psychological implications of abortion is indeed affected by many methodological difficulties5,6, and studies tend to be biased by political7 and moral8 motivations. Methodological difficulties regard mainly the constitution of adequate contrast groups, control for confounding factors, measurement of reproductive history, underreporting of obstetric history13 and attrition (loss of cases during the course of an investigation)5,6. Another relevant limitation of research on psychological implications of abortion is the inability of the application of an experimental design, due to the fact that it would not be ethical nor morally justified to conduct a randomized controlled trial of abortion versus live birth for women with an unwanted pregnancy6. The objective of this work is to identify predictors of future psychological response among personal and systemic characteristics of women who recur to an induced abortion. Prospective longitudinal studies on two cohorts were conducted: the first focusing on a group of women who interrupted a pregnancy due to unwantedness of the pregnancy, the second focusing on a group of women who interrupted a pregnancy by the second trimester of gestation due to relevant fetal abnormalities that posed a risk for their physical or mental health. A consecutive sample of 92 women who applied for elective (VTP) and therapeutic pregnancy interruption (TTP) at Policlinico Umberto I in Rome was recruited from October 2013 to January 2015. The sample has been subdivided into two cohorts, based on intervention typology: VTP (n=57) followed at the Gynecology and Obstetrics Department of Policlinico Umberto I and TTP (n=35) followed at the Psychiatry and Psychopharmacology Department of Policlinico Umberto I for a Supportive Counseling before the intervention. The data collection was based on clinical interviews carried out by gynecological and obstetric operators about socio-demographical and individual anamnestic surveys. The motivations and the circumstances that led to the elective interruption were investigated with a questionnaire. The TTP cohort was evaluated for the different kind of fetal abnormalities. Participants psychological state was examined 5 to 7 days before and about 90 days after the abortion by means of two non-cognitive psychometric questionnaires (SCL-90-R and CES-D). Following abortion, the 35% of VTP sample (n=20) and the 89% of the TTP sample (n=30) came back for follow-up. After the first test screening, two subjects (one VTP for miscarriage and one TTP for term pregnancy) were excluded from further analysis. The study participants were recruited and interviewed by a psychologist working at the abortion application desk of Gynecological Ward of Policlinico Umberto I in Rome. Subjects psychological state was examined 5 to 7 days before and 90 days after the abortion by means of two self-report psychometric questionnaires (Symptom Checklist-90-Revised and Center for Epidemiological Studies Depression) designed to assess psychological problems during the previous week, that were at first administered in hard copy during the phase of application for the interruption of pregnancy. Socio-demographic data and obstetric history were collected by means of a structured interview purpose-developed for the study; socio-demographic data detected included age, education and marital status, while obstetric history data included information on contraceptive methods used at the time of conception, previous miscarriages, previous elective abortions and previous live births. Subjects were also asked their current sentimental status (f.i., if a participant wasnot married but still in a significant relationship) and if they would have accepted psychological support following the operation. Other information regarding situational characteristics of the interruption of pregnancy were detected by means of an extensive interview that focused on the main aspects, methods and reasons underlying the decision to recur to an induced abortion. The Symptom Checklist 90-Revised (SCL-90-R) is a self-administrable questionnaire used for the detection of psychological problems and psychopathological symptoms in the general population14 that measures both internalizing (e.g. depression, somatization, anxiety) and externalizing (e.g. aggressiveness, hostility, impulsivity) symptoms15,16. The SCL-90-R is structured inthree global indices: the Global Symptomatic Index (GSI), the Positive Symptom Total (PST) and the Positive Symptom Distress Index (PSDI): the Global Symptomatic Index (GSI) – which is widely considered as the SCL-90-R’s best single indicator of psychopathological distress16,17, and 9 subscales: Somatization (SOM); Obsessive-Compulsive (O-C); Interpersonal Sensitivity (I-S); Depression (DEP); Anxiety (ANX); Hostility (HOS); Phobic anxiety (PHOB); Paranoid ideation (PAR); Psychoticism (PSY). The questionnaire explores the severity of respondent symptoms over the previous week. The cut-off score for a psychopathological symptomatology of the SCL-90-R’s Global Symptomatic Index (GSI) was set to 0,57. The Center for Epidemiological Studies - Depression scale (CES-D) is a short self-report psychometric questionnaire designed for use in studies of the relationships between depression and other variables across population subgroups18. The CES-D is made up by 20 items that measure an index of major depression in the general population and investigate specific components of depressive symptomatology during the previous week18,19. Each response is scored from zero to three on a scale of frequency of occurrence of the symptom. In addition to the total score, the CES-D also evaluates four subscales: Depressed mood (DEP), Positive affect (POS), Somatic and retarded activity (SOM) and Interpersonal (INT). The four items of the Positive affect subscale (POS) are worded in the positive direction in order to break tendencies towards response set as well as to assess positive affect. Being designed to be well correlated with other scales designed to measure depression 18, the CES-D should accord well with the SCL-90-R. Cut-off score for a psychopathological symptomatology of the CES-D total score, coherently with the Italian adaptation of the test20, was set to 20. The self-report test is structured on 5 items, investigating cognitive and emotional features, that contribute to the elective pregnancy interruption. The investigated features were: the way and the cause of the decision, the prevented effects of the interruption on the couple life and the women perception of the affective support of the partner during this event. 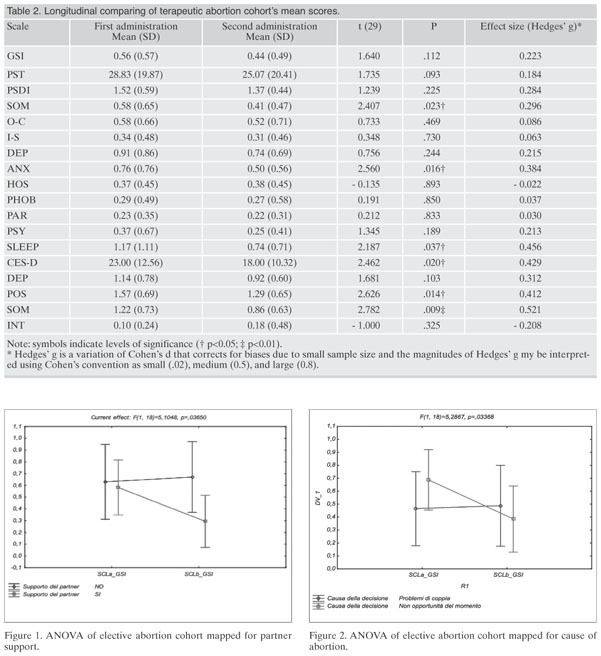 Dependent samples t-test were used to compare levels of psychological distress measured by psychometric questionnaires before and three months after abortion; Hedges’g was used as an effect size measure. For all statistical analysis, the level of significance was set to p<0.05. In order to test different research hypothesis, information extrapolated from interviews and socio-demographic and obstetric data were used to map the subjects of the cohort in different subgroups; repeated measures analysis of variance (ANOVA) was then used to evaluate the variance of these subgroups mean scores’before and after abortion. The Bonferroni post-hoc was used as post-hoc test. For all statistical analysis, the level of significance was set to p<0.05. All data analysis were performed with the Microsoft Office Excel package and the Statistica 10 software. After abortion, all participants were called back for a follow-up phase where the questionnaires have been administered for a second time. Following the recalling, 35% of the VTP original sample (n=20) and 89% (n=30) of the TTP original sample came back for a second measurement of their psychological state. The TVP was composed by 30 women aged between 19 and 41 years (M=29.3; SD=6.34); the TTP cohort was composed by 20 women between 27 and 45 years (M=35.5; SD=5.10). Dependent samples t-test were used to compare levels of psychological distress of the subjects before and after abortion. After the termination of pregnancy, a significant decrease between t-0 and t-1 mean score (p<0.05) was observed in all SCL-90-R’s global scores: GSI (p=0.036), PST (p=.031), PSDI (p=0.004). A significant decrease was found in SOM (p=0.009), DEP (p=0.032) and ANX (p=0.036) subscales. For what concerns the CES-D, the score of DEP (p=0.017) and SOM (p=0.011) subscales significantly decreased as well. This shows a tendency towards an improvement of the mood state in the weeks following abortion, if compared to the days leading to the operation; in particular a positive trend in the depressive and anxious states of the subjects was observed. For all results see Table 1. Dependent samples t-test were used to compare levels of psychological distress before and after abortion. Following the termination of pregnancy, no significant differences were found between t-0 and t-1 mean scores of SCL-90-R’s global indices. A significant decrease was found between SOM (p=0.023) and ANX, (p=0.016). A relevant decrease was found between the CES-D total score (p=0.020), POS (p=0.014) and SOM (p=0.09) subscales. For all results, see Table 2. Repeated measures ANOVA was used to analyze variance of mean scores of different cohort’s subgroups isolated by variables of interest, in order to detect a predictive role of these factors on subsequent mental health outcomes. In order to investigate the predictive role of lack of support by the affective partner, the cohort was divided into two subgroups based on partner support perceived during the event: women who complained about having never felt being supported by their partners (n=7) and women who, totally or partially, felt supported during this event (n=13). Analyzing the variance of the two subgroups’mean global scores of the SCL-90-R with the repeated measures ANOVA, a significant difference emerged (F (1, 18)=5.10, p=0.036). The Bonferroni post-hoc test showed that women who felt supported by their affective partner expressed a significant different SCL-90 global score at the first measurement compared to the second one (p<0.05); the direction of the mean scores of this subgroup shows a decrease of general stress following abortion. For all results see Figure 1. The repeated measures ANOVA, when applied at the CES-D mean total scores of the two subgroups before and after abortion, did not show any significant difference, (F 1, 18=1.20; p=0.29). To test the predictive role of the cause for interrupting the pregnancy, the cohort was split into two subgroups: the first group (n=8) was constituted by women who interrupted the pregnancy because of relationship problems with the affective partner, the second group (n=12) was constituted by women who interrupted the pregnancy because of reasons that did not necessarily imply relational stress (e.g., carrier choice, financial problems, etc.). Analyzing the variance of the two subgroups’mean global scores of the SCL-90-R score with the repeated measures ANOVA, a significant difference emerged (F 1, 18=5,29; p=0.034). In the subgroup of women who aborted because they did not feel ready to carry on a pregnancy, the Bonferroni post-hoc test showed a statistically significant different SCL’s Global Symptomatic Index at the first measurement compared to the second one (p<0.05); the direction of the mean scores of this subgroup shows a decrease of general stress following abortion (Figure 2). The repeated measures ANOVA, when applied at the CES-D mean total scores of the two subgroups, showed a significant difference (F1, 18=7.83; p=0.012); the direction of the mean score of this subgroup show a decrease of depressive symptoms following abortion. In the subgroup of women who aborted because they did not feel ready to carry on a pregnancy for no relational reasons, the Bonferroni post-hoc test showed a statistically significant different CES-D’s total score at the first measurement compared to the second one (p<0.01); the direction of the mean scores of this subgroup showed a decrease of depressive symptoms following abortion. Repeated measures ANOVA was use to analyze variance of mean scores of different cohort’s subgroups isolated by variables of interest, in order to detect a predictive role of these factors on subsequent mental health outcomes. In order to test the predictive role on post-abortion mental health of type of fetal abnormality, the cohort was split into two subgroups: the first constituted by women carrying a fetus affected by life-impairing abnormalities (e.g., anencephaly, cardiac malformations, etc.) (n=22), the second constituted by women carrying a fetus diagnosed with trisomy 21 (n=8). Analysis performed with the repeated measures ANOVA showed a significant difference in variance of mean scores for number of symptoms reported PST (F 1, 28=5.56;p=0.026), and intensity of symptoms related to sleep disorders (SLEEP) (F1, 28=5.79; p=0.023), hostility (HOS) (F1, 28=4.78, p=0.037), and obsessive-compulsivity (O-C)(F1, 28=5.55;p=0.026), following abortion is more represented in being carrier of a trisomy 21 fetus compared to being carriers of a fetus diagnosed with life-impairing abnormalities (e.g., anencephaly).The Bonferroni post-hoc test showed that women carrying a fetus affected by life-impairing abnormalities showed a significant statistical difference, between before and after the intervention, (p<0.05) in the means of SLEEP subscale in SCL-90; the direction of the mean scores of this subgroup shows a decrease of Sleep disorder following abortion. Following abortion, women who underwent an elective abortion showed a general trend towards improvement in mood state, inferred by lower scores at the second measurement of their psychological state if compared to the first measurement. In particular, the decrease was statistically significant at the t-test for dependent samples for symptoms related to depression (both SCL-90-R and CES-D’s depression subscales) and anxiety (SCL-90-R and CES-D’s somatization and anxiety subscales). Coherently with other studies 21 our results showed a significant decrease in mean scores of the depression and anxiety subscales following abortion. Instead, other studies22,23 showed the higher rates of anxiety and depression in the period following abortion compared to controls. It is noteworthy that the drops in the mean scores of the SCL-90-R regarded meanly the “internalizing” aspects (depression, anxiety and somatization) compared to the “externalizing” scales measured by the questionnaire (aggressiveness, hostility, impulsivity). The significant drop in the scores relative to somatization drive us to speculate that somatization can be one of the more relevant defense mechanisms involved in the process of experimenting an elective termination of pregnancy, or that, following abortion, somatization is one of the defense mechanisms that undergo more resolutive processing by women who face this kind of event. The main research hypothesis of this study regarded the negative impact of situational stressors (e.g., lack of support by the affective partner) on psychological response following abortion. The repeated measures ANOVA applied to this hypothesis showed a significant result when women who complained about lack of partner support where compared with women who felt supported by their partner during the days leading to the abortion. The other important result of this study is the different impact evidenced between relational causes of abortion (for example conflictual relationships) and not necessarily imply relational stress causes (e.g. carrier choice and financial problems). The subgroup of women who aborted because they didn’t feel ready to carry on a pregnancy for no relational conditions showed a decrease of depressive symptoms following abortion compared to subgroup of women with relational problem. Following abortion, women who underwent a therapeutic abortion showed a general trend towards improvement in mood state, inferred by lower scores at the second measurement of their psychological state; in particular, the decrease was statistically significant at the t-test for dependent samples for symptoms related to anxiety (somatization, anxiety and sleep disorders), hostility and obsessive-compulsivity. The role of the type of fetal abnormality on subsequent mental health outcome following a therapeutic abortion was supported by repeated measures ANOVA analysis and didn’t show significant differences in global score indices of SCL-90 and CES-D total score. The only significant difference was found in SLEEP subscale of SCL-90 that presented a decrease in women with Trisomy 21 fetus compared to women with life- impairing abnormalities in fetus. The research hypothesis was that women carrying a fetus affected by trisomy 21 (Down syndrome) would have not experienced a significant worse psychological outcome than women carrying a fetus affected by life-impairing abnormalities, such anencephalies or cardiac malformations. The only worse psychopathological dimension in Trisomy 21 fetus abortion was “sleeping disorder”; the speculation revolving around this hypothesis was that women with a fetus affected by Down syndrome have the tendency to think that this abnormality does not justify the abortion – given that this kind of condition is generally characterized by a shorter life span and intellectual disability, but is compatible with life after birth – or that they tend to perceive fewer protective effects of the social acceptance of therapeutic abortion compared with women whose fetuses suffer from more debilitating abnormalities (e.g., anencephaly). The possible after birth vitality of Down syndrome can lead to a maternal moral question and mental recurrent disturbing sleeping quality. Concluding the discussion, although specific women categories show a major risk of incurring in psychological problems, the results of the study suggest that the event of abortion can lead to an improvement of mood state in women recurring to abortion in the following weeks. Before discussing the results of this study, it should be noted that its main weaknesses included a high attrition that reduced significantly the sample size (from 57 to 20 subjects, with a loss of 65% of original subjects), a lack of information about previous mental health problems, and a plausible risk of underreporting of abortive history, given by low reporting of previous elective abortions (only one previous induced abortion among 20 women with a mean age of 29 years) compared to the rates of previous abortions in the source population, the absence of a contrast group should not instead represent a weakness for the study, given that the lack of such a comparison group is not overly limiting when the researcher’s goal is to understand predictors of response among women who undergo an abortion 5. Both the scales which have been used (CESD and SCL90) measure psychopathological symptoms in relation to the previous week. Subsequently, although we found that women who underwent an elective abortion showed a general trend towards improvement in mood state, we did not investigate the psychological status of women before T1 and after T1. In other words, we have explored the psychological effect of abortion in the middle term (about 3 months after the abortion), but not in the short term (for example in the first days or weeks after the abortion, or in the first month) and in the long term (for example after one year from the abortion). Strengths of the study included being a purpose-developed prospective longitudinal study (considered as the best study design to assess the psychological impact of induced abortion by APA 5 and AMRC6 guidelines), having measured subjects’psychological state at the moment of the application for the abortion rather than immediately before the operation – given that higher anxiety caused by the imminence of the event can bias test results5 – having set the follow-up at three months after abortion, which may prevent the detection of temporary feelings related to the abortion in favor of more stable mental conditions, as specified in the APA guidelines5, and having used widely validated instruments (SCL-90-R and CES-D) to assess participants’mental health status. The results of this study showed that, although certain categories of women are found to be most vulnerable to psychological problems following abortion (e.g., lack of emotional support from the affective partner), women who recur to an abortion tend to bring a significant improvement in mood in the weeks after the event compared to the days before the operation. – Considering women with different characteristics, different way and time of pregnancy interruption, the data collection seems to suggest that interruption for therapeutic reasons is not a more significant risk factor for psychopathological problems than an elective interruption. – It is important to consider the need for support and care for all women who have an unwanted pregnancy because the risk of mental health problems increases independently by the pregnancy outcome6. Recognitions for collaborations and economic support of research: we thank Dr. Maria Luisa Indelicato for the help provided in the collection of research data. 1. Legge 22 maggio 1978 - Norme per la tutela sociale della maternità e sull’interruzione volontaria di gravidanza. Gazzetta Ufficiale 1978; n. 140 del 29 luglio 2003 - Supplemento Ordinario n. 123. 2. AAVV. L’aborto: atti della tavola rotonda svoltasi a Roma il 17 aprile 1973. Roma, Movimento Gaetano Salvemini, 1973. 3. Scirè G. L’aborto in Italia, storia di una legge. Milano: Bruno Mondadori, 2011. 4. Ministro della Salute, Relazione sulla attuazione della legge contenente norme per la tutela sociale della maternità e per l’interruzione volontaria della gravidanza (Legge 194/78) 2015. 5. Major B, Appelbaum M, Beckman L, Dutton MA, Russo NF, West C. Report of the APA task force on mental health and abortion. Washington, DC: APA Press, 2008. 6. National Collaborating Centre for Mental Health. Induced abortion and mental health: a systematic review of the mental health outcomes of induced abortion, including their prevalence and associated factors. London: Academy of Medical Royal Colleges, 2011. 7. Charles VE, Polis CB, Sridhara SK, Blum RW. Abortion and long-term mental health outcomes: a systematic review of the evidence. Contraception 2008; 78: 436-50. 8. Adler NE, David HP, Major BN, Roth SH, Wyatt GE. Psychological responses after abortion Science 1990; 248: 41-4. 9. Stotland N. The myth of the abortion trauma syndrome. J Am Med Assoc 1992; 268: 2078-9. 10. Munk-Olsen T, Laursen TM, Pedersen CB, Lidegaard Ø, Mortensen PB. Induced first-trimester abortion and risk of mental disorder. N Engl J Med 2011; 364: 332-9. 11. Major B, Cozzarelli C, Cooper L, et al. Psychological responses of women after first-trimester abortion. Arch Gen Psychiatry 2000; 57: 777-84. 12. Steinberg JR, Russo NF. Abortion and anxiety: what’s the relationship? Soc Sci Med 2008; 67: 238-52. 13. Jones RK, Kost K. Underreporting of induced and spontaneous abortion in the United States: an analysis of the 2002. National Survey of Family Growth. Stud Fam Plann 2007; 38: 187-97. 14. DerogatisLR. Symptom Checklist-90-R: administration, scoring and procedures manual. Minneapolis: National Computer Systems,1994. 15. Derogatis LR. Manuale di somministrazione e scoring. Adattamento italiano di SCL-90-R (a cura di Sarno I, Preti E, Prunas A, Madeddu F (a cura di). Firenze: Giunti, OS, 2011. 16. Prunas A, Sarno I, Preti E, Madeddu F, Perugini M. Psychometric properties of the Italian version of the SCL-90-R: a study on a large community sample. Eur Psychiatry 2012; 27: 591-7. 17. Frank-Stromborg M, Olsen SJ. Instruments for Clinical Health-care Research. Burlington, MA: Jones & Bartlett Learning, 2004. 18. Radloff LS. The CES-D scale: a self-report depression scale for research in the general population. Appl Psychol Meas 1977; 1: 385-401. 19. Conti L. Repertorio delle scale di valutazione in psichiatria. Firenze: Società Editrice Europea, 1999. 20. Pierfederici A, Fava GA, Munari F, et al. (eds). Nuovi metodi in psicometria. Firenze: Giunti, OS, 1982. 21. Cohen L, Roth S. Coping with abortion. J Human Stress 1984; 10: 140-5. 22. Reardon DC, Cougle JR. Depression and unintended pregnancy in the National Longitudinal Survey of Youth: a cohort study. BMJ 2002; 324: 151-2. 23. Kersting A, Kroker K, Steinhard J, et al. Complicated grief after traumatic loss: a 14-month follow-up study. Eur Arch Psychiatry Clin Neurosci 2007; 257: 437-43.